Tarynne Mingione is a registered dietitian and registered yoga teacher. She earned a Bachelor of Science in nutrition at Bastyr University and completed Baylor College of Medicine Neonatal Nutrition Fellowship. Her experience also includes diabetes camp dietitian and wellness event health educator and teaches yoga at various locations. You shouldn't take iron supplements while consuming coffee because coffee inhibits iron absorption from both supplements and food. If you are taking iron supplements and eating high-iron foods, you should consume them at least one hour before and more than one hour after consuming coffee and other iron absorption inhibitors. Men age 19 and older require 8 milligrams of iron per day. Woman age 19 to 50 have a recommended intake of 18 milligrams per day; age 51 and older need 8 milligrams per day. Pregnant women of all ages have recommended iron intakes of 27 milligrams daily. For male and female adolescents age 9 to 13 years, recommended amounts of iron are 8 milligrams daily. Vitamin C enhances iron absorption, particularly from nonheme iron. Eat citrus fruits, peppers, spinach and other vitamin C-containing foods when taking iron pills to enhance absorption. 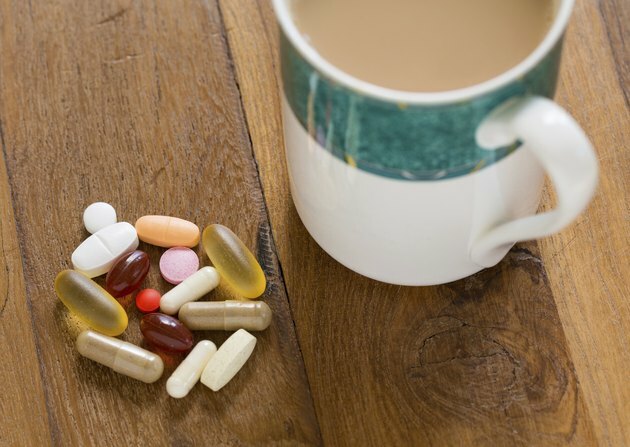 Immediately before and after taking iron pills, avoid tannins -- found in tea and coffee; high-fiber foods; soy protein; and calcium supplements. Should You Take Iron With Vitamin C?